Remothered: Tormented Fathers is one of the most interesting horror games released in recent times, thanks to the lack of jump scares which are now prominent in the genre and a very interesting story that takes players in and only lets them go when it ends. With the game coming to PlayStation 4 and Xbox One in the near future, we talked with director Chris Darril about the ports as well as the possibility of a Nintendo Switch release and playable expansions. Meanwhile, the PC game can be purchased via Fanatical. Remothered: Tormented Fathers is a very different horror game than most modern ones, choosing to provide a constant feeling of tension instead of relying on jump scares. Why did you decide in going in such a direction? In my humble opinion, as a game developer as well as a gamer, the secret behind true horror doesn’t lie in the research of an evanescent moment of fear that gives you just a jump scare. What really makes the difference is the sense of anxiety and paranoia that a work of art can release constantly, drop by drop, in the audience. This kind of terror won’t probably make you jump from your chair, most of the times, but it will force you to see with your own eyes the ambiguity around you, inside yourself and discover the fight against your deepest inner fears. The Clock Tower influence is evident throughout the duration of the game, but is there any other inspiration, even outside of video games? I love horror movies and directors such as Polanski, Lynch, Hitchcock and Pupi Avati, the Italian director known for his masterpiece “The House with Laughing Windows”. Players who also have cinema among their interests will likely notice the influence of cinematography in “Remothered: Tormented Fathers”. Independent horror games usually sport a first-person view, which is definitely easier to develop. Why did you choose to go with a more demanding third person one? CD: Thanks to the third person point of view, players can really immerse themselves into the atmosphere of the game in a very cinematic way, as friends and supporters of Rosemary Reed, the main character. In this way, you can appreciate the details of the character that you are impersonating. 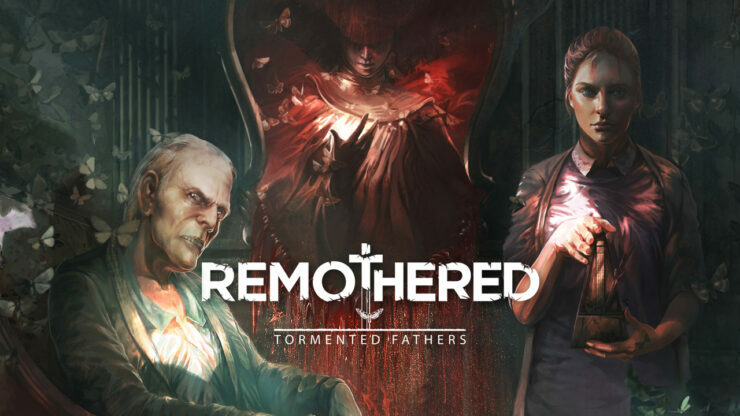 Taking advantage of the first-person point of view would have been definitely easier, but honestly, I could not imagine “Remothered: Tormented Fathers” with a subjective perspective. We’ve done a lot of work to implement third-person perspective and I’m very satisfied with the final result. Remothered: Tormented Fathers works well for the most part on PC, but it’s difficult not to notice the stiff animations, which take something away from the game’s immersion. Are you planning on improving them in the future, or add any other improvement or new features? We’ve collected feedback from the community and the attention from survival horror fans is something that makes us very proud, considering that “Remothered: Tormented Fathers” is an indie game and is our debut title. By the way, we take players’ advice to heart: this will allow us to improve ourselves in future titles. The game has yet to release on PlayStation 4 and Xbox One. Will they be any different from the PC release? Will the game be enhanced for PlayStation 4 Pro and Xbox One X and if so, can you share the respective technical specifications? Porting is almost over and I can tell you that the overall gaming experience is going to be very similar to the PC edition. Unfortunately, I cannot say more about it. Keep following us to discover when the game will come out for PlayStation 4 and Xbox One and if there will be more surprises. Many independent developers are releasing games on Nintendo Switch, commenting how the console is a perfect fit for their games. Any plans to release your game on Nintendo’s hybrid console? To be honest, Switch version is not in development right now, but things can change in the future. Who knows? Do you have any DLC/expansions planned for Remothered or would you rather work on a sequel (or an entirely new project, perhaps)? There are no playable expansions planned, however, we’ve released two downloadable DLC’s on Steam: the original soundtrack and the artbook. The soundtrack of “Remothered: Tormented Fathers” is composed by Nobuko Toda (if you’ve played Final Fantasy, Halo, Metal Gear Solid you’ve heard her music before) and Luca Balboni. Fans who want to discover the concept behind the videogame can download the digital artbook with all the illustrations, storyboard and many others artworks I’ve created for “Remothered: Tormented Fathers”. By the way, being announced as a trilogy, for sure, you can expect a sequel but it’s something so premature to talk about, even though I cannot wait to tell you more.